This week marked a major first. 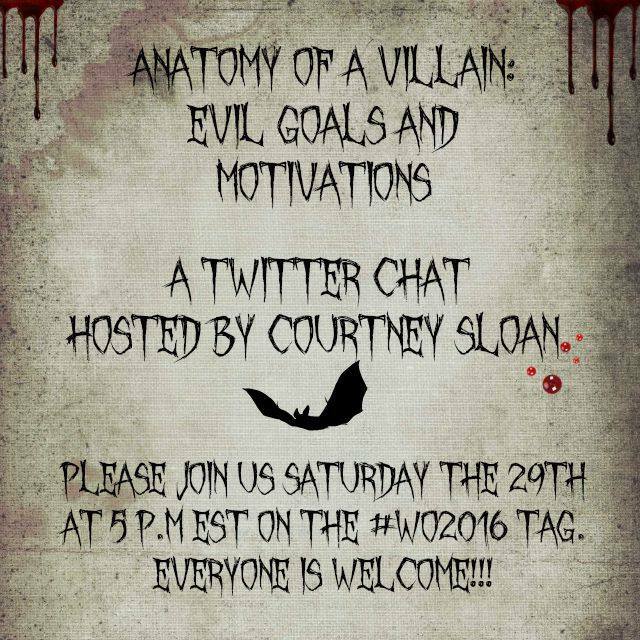 In my #WO2016 group, a group for authors how have books coming out in 2016, I volunteered to lead a twitter chat. Being a new adult author of very dark urban fantasy, in a world of vampires and shifters ruling the underclass of humans, the less than heroic characters are important to me. So, the subject I came up with for the chat was all about villains. What could be better? Who was your favorite villain of all time? What made that villain stand out above the rest? Who would you consider the weakest villain of all time? What made that villain so ineffective? It’s been said villains are the true reflections of the hero, do you agree? What makes a villain a villain instead of a protagonist? How to keep empathy with a villain without surrendering their evil? Wounds: how MCs and Villains treat them differently. A good villain forces the hero to evolve: what do you think? Villains generate the primary conflict in stories: how do you make that happen? What are the worst villain clichés? What is your current villain’s GMC? What inopportune truths does your villain reveal to the hero/world? It was the fasted hour in my life. I could barely get questions and thoughts out before responses flooded in. I learned a great deal, and I will be a better writer for it. But after only ten minutes something incredible happened, something I didn’t expect. Our discussion was popular enough it was categorized as trending on the main twitter page. I’ve never been a part, let alone leading, a trending twitter chat. So many talented views and thought compounded together to get the notice of such a worldwide program. I am humbled. Writing also went well. I got through some major hurdle chapters and wrote about 13k words. I also got through about half the interviews. I will finish the interviews by this weekend and write through the next two attacks by next Wednesday’s check in. Thanks for keeping me working and going, guys. This entry was posted on Wednesday, September 2nd, 2015 at 12:01 am	and tagged with Writing Wednesdays and posted in Authors, Covers, Dark, medium, New Adult, Of Scions and Men, Scions of Wrath, shifter, Twitter, Urban Fantasy, vampire, Writing Wednesdays. You can follow any responses to this entry through the RSS 2.0 feed.